Bulk order discounts are available. Please contact us for latest pricing, colour options, sample packs and selection advice. 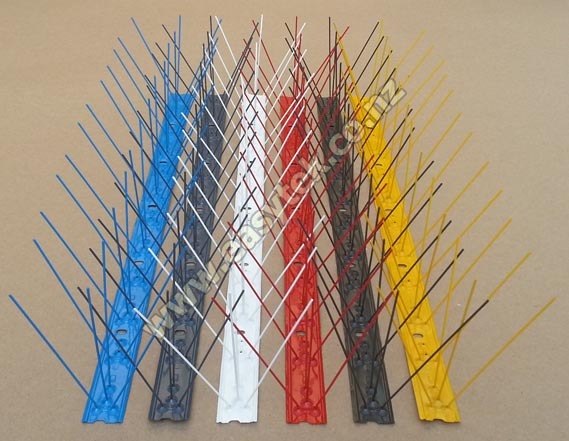 Color bird spikes are the ideal design solution for permanently bird proofing residential homes, warehouses, sheds, and many buildings. Color spikes are available in a variety of colors. These spikes perfectly blend into the environment. The color spikes are also used as a "highlighter" for stylish design applications. Colored steel prongs and base offer the perfect long-life solution. The flexibility of spikes allows mounting on flat or curved surfaces. Spikes are easy to install with adhesive, nails, screws, wire ties, etc. Birds instinctively fly to "landing strips" such as roof ledges, window sills, building projections, signs, statues, trusses and beams. 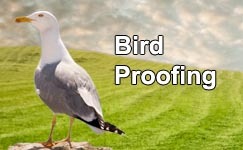 Permanently deter birds from landing and roosting on any surface. Center row of spikes prevent birds from landing between prongs. Bird proofing your property with stylish color bird spikes adds value to it and prevents unsightly bird droppings, diseases and damage caused by birds. Bird spikes help eliminate cleaning and building maintenance costs. 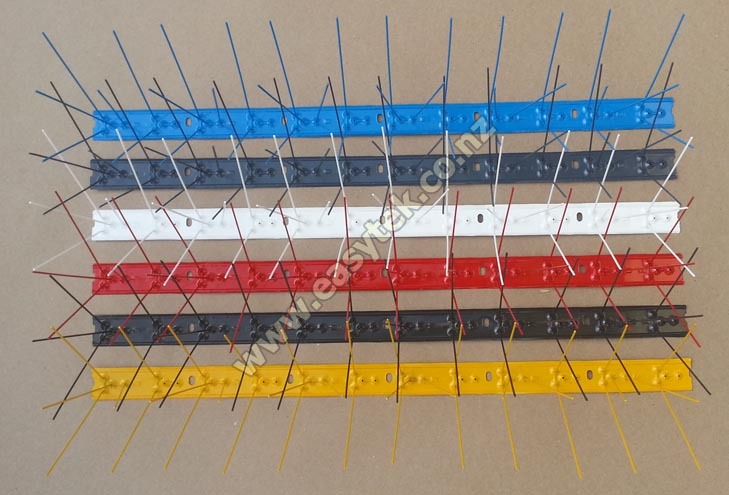 Colored steel spikes with colored steel base attach to virtually any surface using nails, screws, adhesive, wire ties, etc. Available in multiple colors to blend into the environment or for stylish design applications. HEAVY DUTY PROTECTION colored steel spikes and colored steel base. Extra center row of spikes for smaller birds. EASY INSTALLATION using nails, rivets, screws or spikes adhesive (also available). STYLISH, available in a variety of colors. Pests: Birds (Pigeons, Gulls, Sparrows, Starlings, Blackbirds, Magpies, Swallows and more) and climbing animals. Uses: Use on edges, beams, rafters, railings, air conditioners, signs, windowsills, gutters, roof perimeters, chimneys, support structures, fences, awnings, poles, lights, statues, trusses, building projections and anywhere else where birds roost.